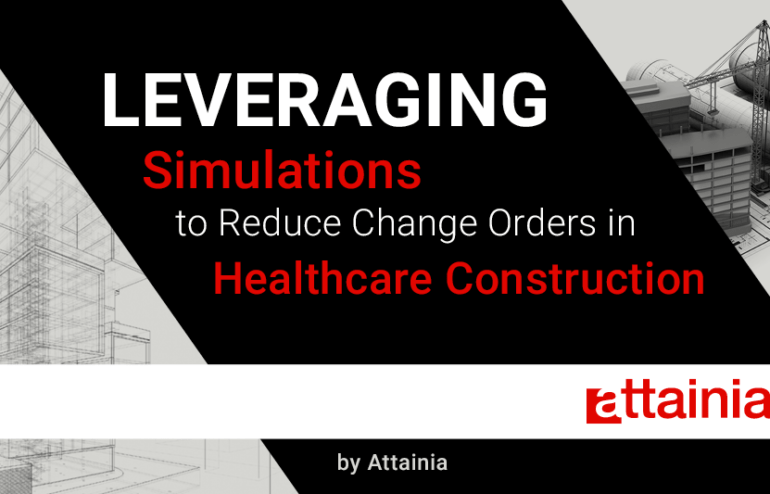 Lean management may be a given when it comes to healthcare construction but the need to ensure to decrease change orders still remains. Like cooking a multi-course meal, tasks must be started in a certain order and if a component or set of materials isn’t available, it can have consequences for other systems, from HVAC to imaging equipment. Accurate simulations prior to breaking ground are critical in order to limit overruns. Optimizing spaces and property for healthcare goals is far more critical than so-called “monument building” where towering edifices are designed to last for half of a century. Focusing on patient-centered construction is more cost-effective and beneficial, just as patient-centered care is. Involving maintenance staff, nurses, surgeons and administrators early on is key. They will have the best sense of what equipment they need. But, each group of stakeholders can also map out the ways that they work. For each activity, using simulations to model the walking paths and chokepoints will help designers streamline spaces and paths. Combined with the right equipment, it reduces time and maximizes staff efficiency. At a more macro level, those same step paths can help administrators as they examine the goals of their new facility. Imagine a focus on integrative care, or maximizing hospital beds by increasing the usage of certain wings that can help maintain revenue goals. By seeing how it currently works for the staff, simulations can help outline costs and opportunities for different building## scenarios. Lobbies, cafeterias and EDs all have different HVAC, lighting and other needs. Making sure that departments with similar needs are located near each other reduces overall construction costs by limiting redundancy of services and physical plant. Of course, you have to weigh this against the point above. Ideally, you can manage to improve staff efficiency and still have this same grouping. That’s not always possible, but healthcare construction managers can certainly work to build common areas and access points together to take advantage of ambient light, and heating and cooling opportunities. While those areas may not need the same level of insulation or even shielding, there are, of course, also HVAC similarities for disparate areas like cooking, food, and laboratory storage. Finding the sweet spot between the two before a single hole is dug is the critical difference between achieving the same goals at a lower budget and facing ad hoc modifications and change orders afte## r the fact. Using a vendor or distributor for medical equipment with adequate data helps construction project managers and healthcare administrators estimate pricing and dimensions. Attainia’s offerings include specs, electrical needs, dimensions and sizing, and the ability to directly reach out to vendors. The key is to be able to model the function of spaces and use cases before anything reaches a job site with minimal headaches that occur with design changes. Time invested early in the process can result in fivefold savings later in the build process. As noted above, late changes could require ripping out entire sections of a wing and re-doing anything from electrical to plumbing to sheetrock because of a seemingly minor equipment change.